Scoop Baroque design, antique broken-leaf burnished gold, black panel, corner ornaments. Kevane & Company has searched far and wide to find this extraordinary collection of wall Picture Frames! Please be sure not to miss our entire collection of Picture Frames. On Sale 45% Off from Now until Friday April 19, 2019! 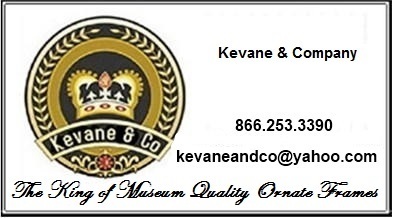 Kevane & Company has a $75.00 minimum order in order to purchase from our online shop. On July 27, 2013 we began adding our newest collection of finished corner, ornate corner custom frames, the newest part of our Manhattan Gallery Frames and Mirrors Collection. Ornate corner frames for ANY size art - featuring Museum Quality finished corners and execution. On April 23, 2012 we began adding our new collection of Manhattan Gallery Frames and Mirrors. We started with our Baroque High Gloss Mirror Collection. Trendy, edgy and magnificent! On March 10, 2009 we added our new section of Custom Frames Series 2000 Custom Picture Frames - this is a terrific new collection of Custom Frames! On January 5, 2009 we added our new section devoted to Oval Picture Frames - this is a great new collection and a popular destination on our site! On November 28, 2008 we added our new "1200" series of Ornate Picture Frames - Series 1200 Picture Frames - this is a great new line of upscale Picture Frames! On October 11, 2008 we added our new "1000" series of Ornate Picture Frames - Series 1000 Picture Frames - We are very excited about this new line of upscale Picture Frames! On October 11, 2008 we added our new section devoted to - Oval Picture Frames - We are very excited about this collection and will be working to increase our selection of these hard to find oval frames. On May 1, 2007 we added our "600" series of Picture Frames - Picture Frames - This is a jigh quality line of upscale Picture Frames! On January 17, 2006 we began adding just under 1,500. Picture Frames in 132 different styles to our Picture Frames section. These picture frames are an outrageous value! On December 10, 2005 --- began adding over 1000 new lamps under the NEW Classic Lamps - Classic Lamp Gallery which is in the Lamps & Lighting section -- the new lamps are Here. On November 25, 2005 we began adding Jeanne Reed's Home Accessories - We have begun with the Porcelain and Tole Sections. We just love Jeanne Reed's - It is hard to find and of exceptional high quality. Happy Hunting! Return to the Kevane & Company Homepage. Don't miss the extraordinary Furniture, Home Accessories and values at Kevane & Company.